On an already hot comal or dry skillet set over medium heat, toast the chiles for about 10 to 15 seconds per side. They will become more pliable and release their aroma. Remove the chiles from the pan and place them in a cooking pot along with the tomatillos, tomato and garlic cloves. Cover with water and bring to a boil over medium-high heat, and simmer for 10 minutes, until they are soft and cooked. Transfer to a blender along with 2 whole cloves, ground cinnamon, oregano, salt and pepper. Puree until smooth and set aside. In a large skillet, heat 3 tablespoons of oil over medium-high heat. Gently add the chicken pieces skin side down first, and brown on each side for 3 to 4 minutes. Incorporate the onion and cook 2 to 3 minutes, until soft and translucent. Pour the reserved pureed sauce on top, add the hojas santas if using, and cook until it has seasoned and thickened, about 8 to 10 minutes. Add the chicken stock, bring to a simmer and keep at a steady simmer on medium heat for about 15 to 20 minutes. Reduce the heat to medium-low, add the masa dumplings one by one to the pan. Cook for another 12 to 15 minutes, or until the dumplings are cooked and the mole thickens enough to coat the back of a wooden spoon. Every Sunday my friends and I take turns cooking dinner. It has to be something we’ve never done before. This recipe is going to be my next meal to cook when it’s my turn. I saw you do this on your show and I’m ready to give it a go. That sounds like such a fun tradition, Greg. I hope you guys love the chicken. I love your show and watch often. You, your family and recipes are a treat and a joy! I make tamales and thought it would be great to make chicken mole tamales and knew your recipe would be worthy. I plan to double it but I’ll have to separate the meat, skin, bone the pieces. It’s worth it but wanted to ask if you have any other suggestions that would maybe exclude individual pieces etc.? I don’t mind going through the work but would like to make more than a dozen or two to make it worth my while. Generally, I don’t make less than six dozen at a time. No other changes, it will work great for tamales…have fun making them, Maxine. Patti, I’m a 73 year old guy who pretty much dislikes cooking shows. However, you are such a sweetheart that when I happen across your program I just have to watch it. So I’m 73 : ( and you are married.. Sigh. 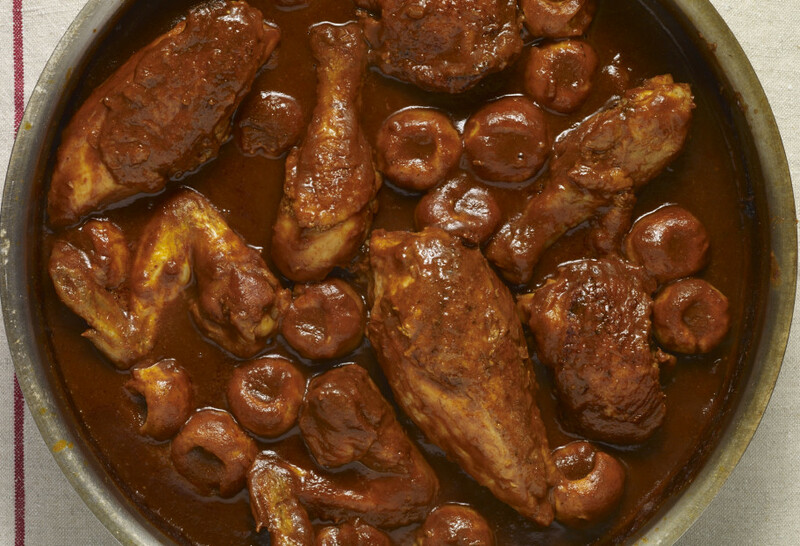 Well, at any rate “Amarillito Mole with Chicken” looks like a real prize, and I’ll probably have to try a simplified (in terms of ingredients) version of it. Thank you for that, and your intelligence and charm. Aww thank you so much! I hope you love the mole! Pati when I transfer the chiles tomatillos, tomato and garlic cloves to blender is that with the liquid or just, the chiles tomatillos, tomato and garlic cloves? No liquid…just the chiles, tomatillos, etc. Oy. I wish I read this comment before cooking. Guess I have A LOT of reducing to do. Still tastes good; just more like a soup than a sauce at the moment.